Manchester United are confident David De Gea's future is at Old Trafford. The Spanish keeper's contract expires in 2016 and the 24-year-old is aware of reports of interest from Real Madrid. United have not said if contract talks have begun, although it would be normal practice as the deal is about to enter its final 18 months. Senior club sources say they are "relaxed" about the future of a player that captain Wayne Rooney feels is "the best keeper in the world". De Gea, an £18.9m arrival from Atletico Madrid in 2011, was outstanding in Sunday's 3-0 win over Liverpool at Old Trafford. Even though former Barcelona keeper Victor Valdes is currently training with United as he recovers from major knee surgery, De Gea is still viewed as an integral part of Louis van Gaal's squad. "David is important for us," said Rooney. "His performances have been fantastic." 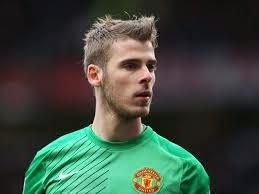 De Gea's form was inconsistent when he first moved to United. In November 2012, manager Sir Alex Ferguson dropped him for five games. Then, after a particularly troubled game at Tottenham a couple of months later, De Gea was criticised by former United captain Gary Neville . Now, though, De Gea is widely accepted as being one of the best goalkeepers in the Premier League and was named Manchester United's player of the year last season. "To play in goal at Manchester United at 20 is difficult," said Rooney. "We knew it might take time. But he worked on his game and it shows. "He is not as tall as some other keepers, but his spring and reach is really long. He is also more vocal now. "Edwin van der Sar had the best years of his career with us when he was in his late 30s, so David has got a great future ahead of him."